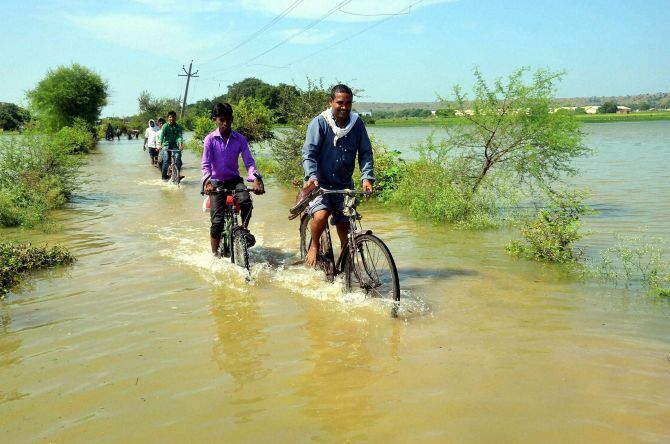 Twenty people were killed on Saturday in rain-related incidents in Madhya Pradesh and Rajasthan even as rivers continued to be in spate in Bihar. Fifteen deaths were reported in Madhya Pradesh since Friday evening as the Met department predicted more showers and sounded heavy downpour alert for some districts on Sunday. 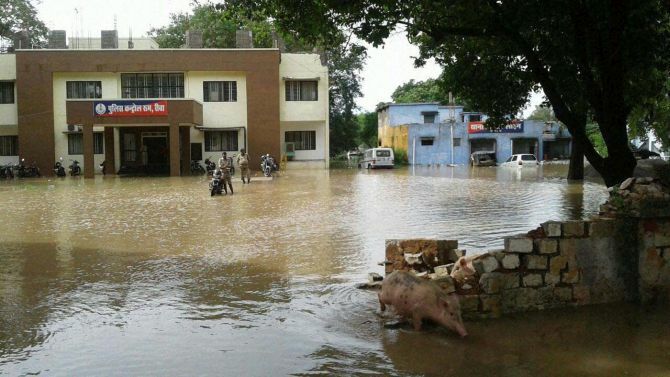 Three Indian Air Force aircraft dropped food packets and medicines in flooded areas of Rewa district, collector Rahul Jain said. Seven people, including a woman and four minors, were killed and three others injured when a house collapsed in Rahatgarh area of Sagar district. Two people including an old woman were also killed and seven injured this noon when a newly-constructed building collapsed amid incessant rains at Maihar, Satna district of Madhya Pradesh. A jeep carrying two persons was swept away in the swollen Betwa river as it tried to cross a bridge in Raisen district. Three bodies were recovered from a nullah in Chhattarpur district. The victims were in a car which was washed away off a bridge on the flooded nullah on Friday. In Rajasthan, five people died when their house collapsed in Phool Baroda village in Baran district due to incessant rains since Saturday morning that created flood-like situation in several areas in the state. Several people are feared stranded in Chabra, Chipabarode, Kawai, Harnavadashahaji areas as the Parvan, Parwati, Ujjad and other rivers are overflowing after the rains. The army was called in the flood-affected areas of Baran district as senior officials also rushed to the spot. At least 24 people were airlifted in Baran district and nearby areas. Several villages are inundated as water has entered buildings, houses and a private power plant in Baran. Baran and nearby areas have been witnessing heavy rains since Friday. Meanwhile, two youths were reported as having been swept away by strong current of water in Balapura Dam near Chipabarode town of Baran district. One of the youths was reportedly rescued hours later while the other is still missing and the search operation is underway. The national capital experienced a humid day and the mercury too settled at two notches above normal. "The maximum temperature was recorded at 35.9 degrees Celsius and minimum 27.6 degrees Celsius, both two notches above normal," a MeT official said adding the humidity levels oscillated between 85 and 60 per cent. 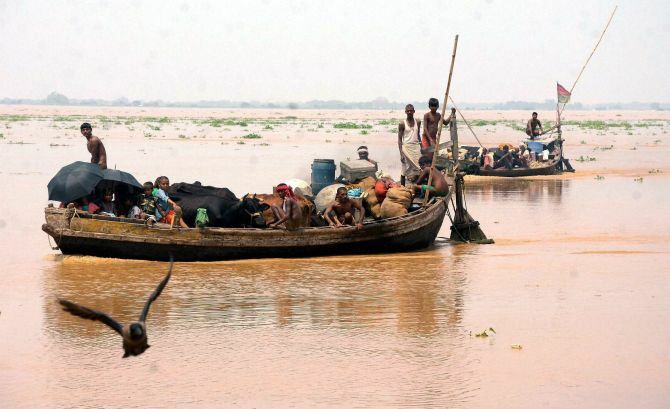 The rising water level of Ganga affected all the districts situated along the banks of the river in Bihar with riverbank areas of the districts bearing the brunt. Ganga and five other rivers were flowing above danger mark in Patna, Bhagalpur, Khagaria, Katihar, Siwan, Bhojpur and Buxar districts. More rain is likely to aggravate the flood-like situation in areas situated on the banks of the Ganga. 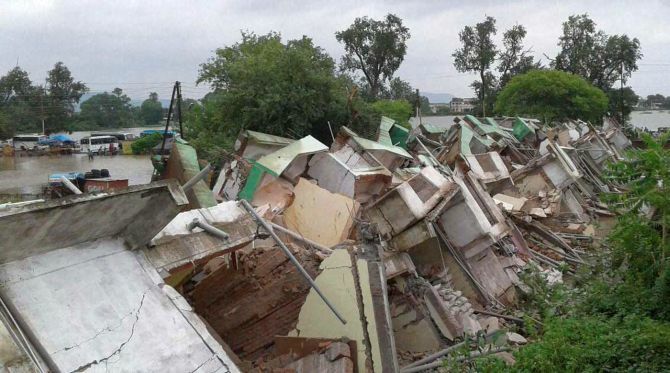 Rani Gupta (65) and Bablu Martin (45) were killed and five others injured when a three-storey building, constructed by the Madhya Pradesh Housing Board, collapsed in incessant rains at Maihar in Satna district at around 10 am on Saturday, collector Naresh Pal told PTI. Prima facie it seemed that the sub-standard material used in the construction led to the collapse, Pal said, adding that 22 shops on the ground floor were constructed in 2013-14 while 20 flats on the second-third floors were built in 2014-15. 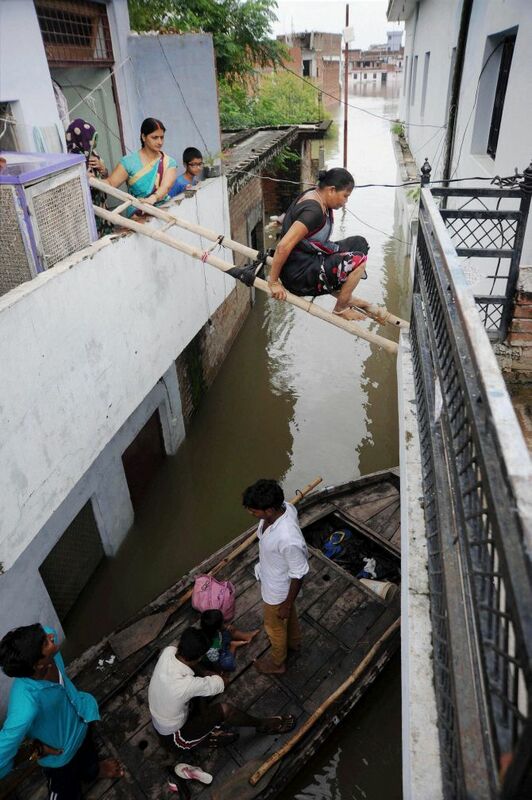 The building might not have withstood force of the water that had inundated the pavement for two-three days, the collector said, adding that rescue operation was still on, but according to the local people, only seven persons lived there. Number of casualties was not high as the shops had not opened when it collapsed, and several flats had no one living there because the allotment process was still underway. Some labourers living in the building too had left for their homes for Rakshabandhan, the collector said. Sanjay Singh Dhakat (35) and Padam Singh Bhadoria (40) who were returning from Bhopal in a jeep were swept away in the water flowing over a bridge on Betwa river on NH 146 in Raisen district last evening, said the Superintendent of Police Dipak Verma. Bodies of Akshay Jain (22), Vabhav Jain (25) and N Jain (25), residents of Sagar district, were recovered from a nullah in Chhattarpur district on Saturday, Additional Superintendent of Police Neeraj Pandey said. They were travelling in a car which was washed away while crossing a bridge over the swollen Chipa nullah. Indian Meteorological Department's Bhopal Centre Director Dr Anupam Kashyapi said heavy downpour alert had been issued to Vidisha, Rajgarh, Raisen, Bhopal, Sehore, Sagar and Damoh districts for the next 24 hours.